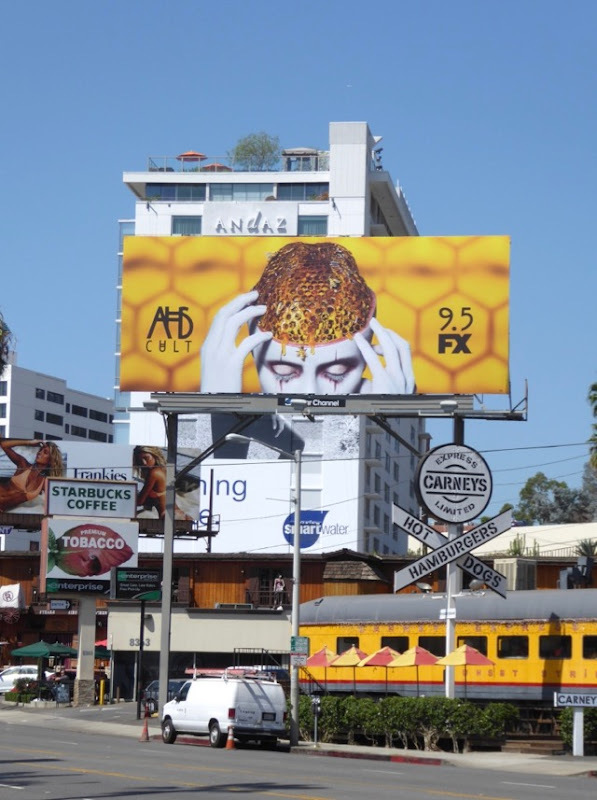 Sometimes Daily Billboard's head hurts thinking about the sheer volume of billboards filling L.A.'s sprawling skyline, especially at this time of year with a new fall TV season imminent. 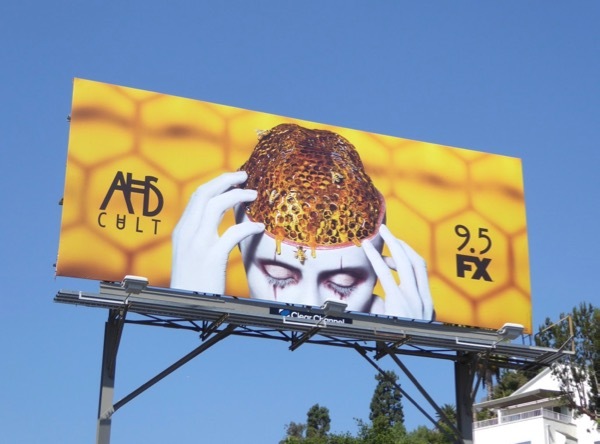 But think how much your head would hurt if it was made of honeycomb, or you had a bee buzzing around your brain. 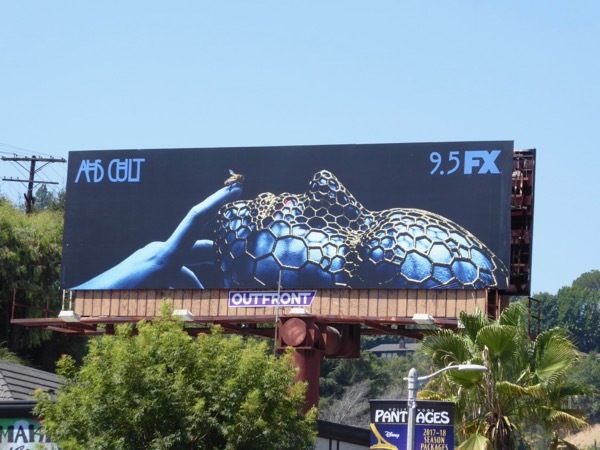 FX's horror anthology series, American Horror Story, is back for a seventh wicked installment with this season dubbed Cult. 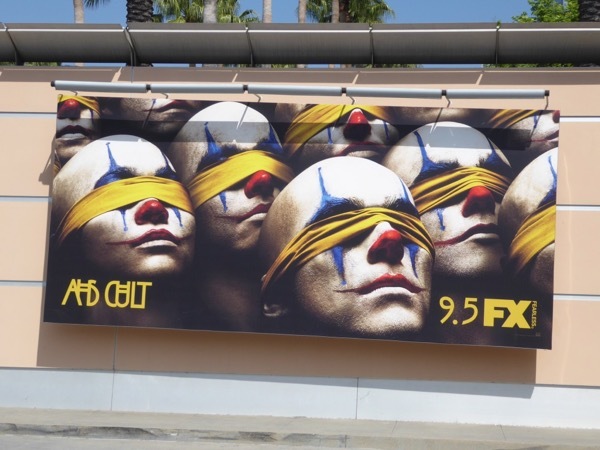 The show is also back with some killer key art in the city skyline, with imagery themed around clowns and bees (some would say the ultimate cult with their hive mentality). 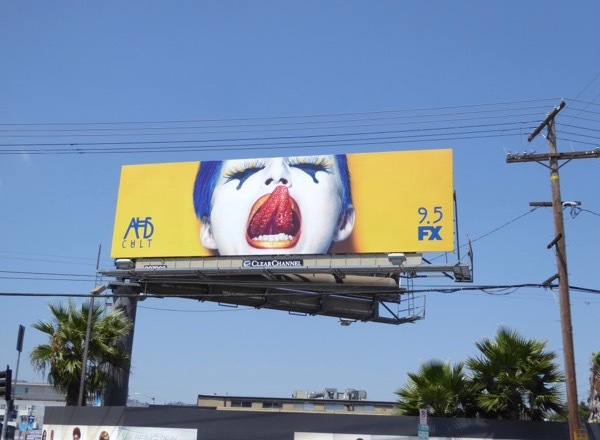 What we also know about this season of Ryan Murphy and Brad Falchuk's series that changes characters and themes with each iteration, is that it'll also focus on the recent U.S. Presidential Election and series regular Evan Peters will play multiple cult leaders throughout history. 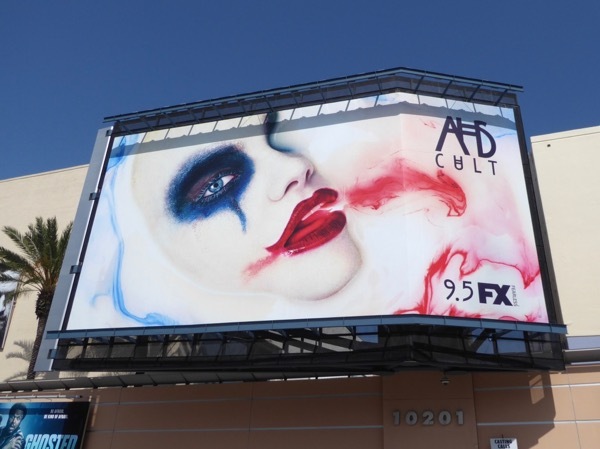 AHS: Cult will also see the return of stars like Sarah Paulson and Cheyenne Jackson, plus welcome newcomers like Alison Pill, Billy Eichner, Colton Haynes, Lena Dunham and Billie Lorde. 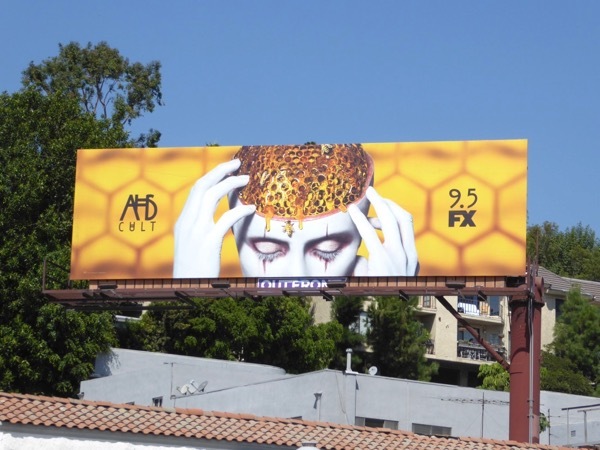 The sixth season's AHS: Roanoke was almost a like palate cleanser after a steady diet of ghosts, witches, freaks, serial killers and vampires, so it'll be interesting to see what horrors the show delivers next. 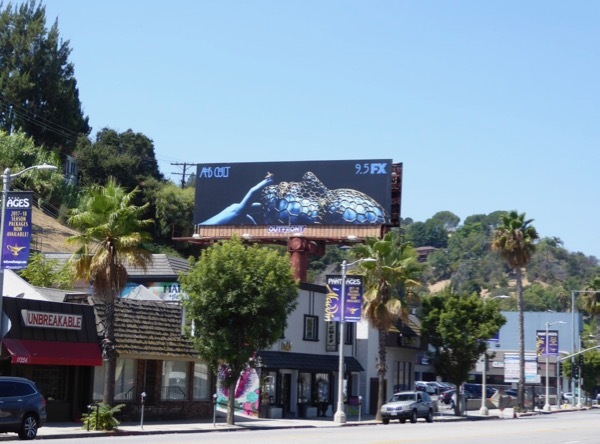 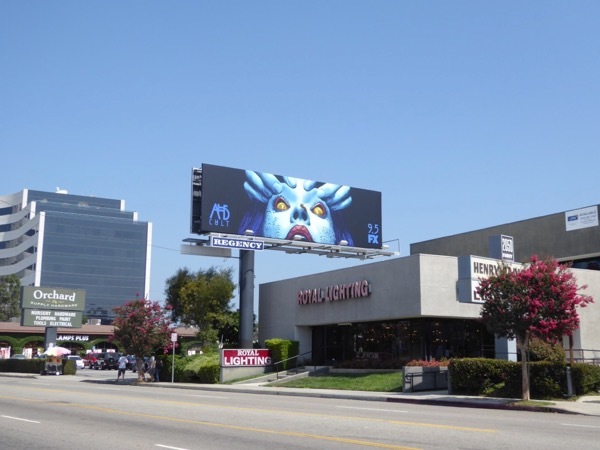 These striking season seven billboards were spied along La Brea Avenue, the Sunset Strip, Santa Monica Boulevard, Pico Boulevard, Bundy Drive, Ventura Boulevard and Cahuenga Boulevard from August 16 to August 26, 2017. 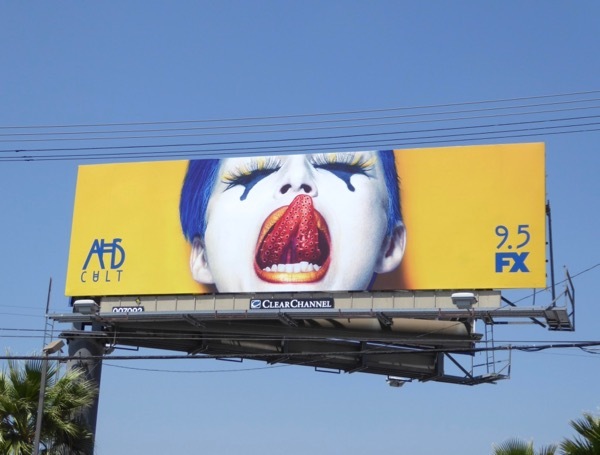 Followers of the twisted TV series can also enjoy these previous season promo billboards for American Horror Story, from 2011 when the show launched to date. 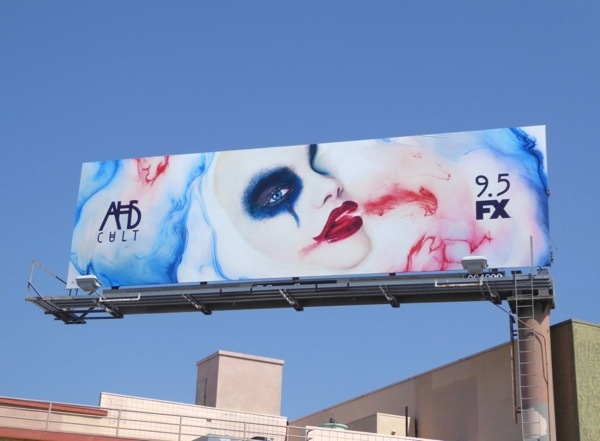 Plus for more creepy clown-themed billboards be sure to check out these IT movie billboards, this Poltergeist movie billboards and even this Heath Ledger Joker billboard. 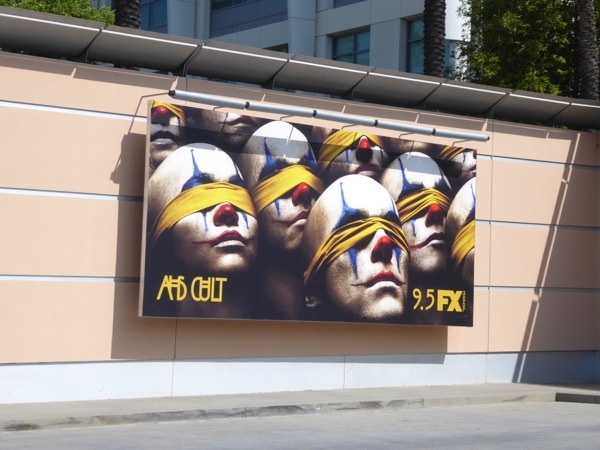 Meanwhile for more TV shows focusing on cults, take a look at these billboards for The Following, these billboards for The Path and this Cult billboard. 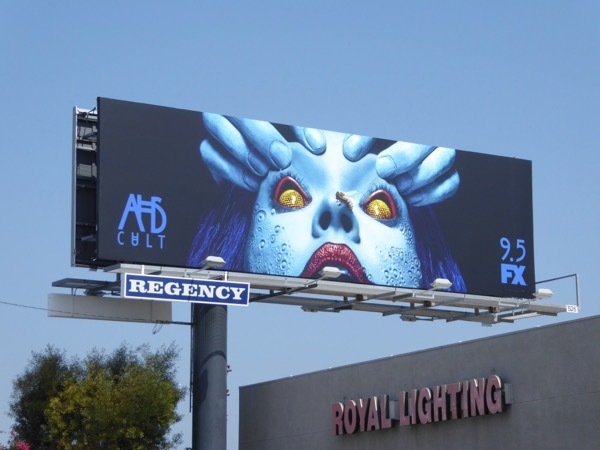 American Horror Story's billboards never disappoint, so here's hoping that the seventh season can continue to supply the sinister surprises and scares viewers want every week.